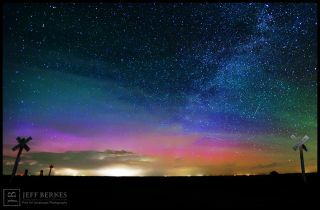 Jeff Berkes captured this photo of the northern lights, a Bootid meteor, lightning and the Milky Way in Greensburg, Kan. on June 29, 2013. While pursuing storms across the United States, photographer Jeff Berkes snapped a surprise smorgasbord of night sky delights, including the northern lights, a Bootid meteor, lightning and the Milky Way. "Storms were not in the forecast, but storms like to find me one way or another. As the storms closed in on our location we shifted our cameras 180 degrees to the north and noticed the auroras spiking out above the thunderheads," Jeff Berkes wrote SPACE.com in an email. He captured the photo in Greensburg, Kansas. on June 29 not long after midnight. Seen in the night sky toward the constellation Bootes, the June Bootid meteor shower can be viewed each year from June 26 to July 2.